Benchmark Results: AS SSD showed the Samsung SSD 950 Pro 512GB NVMe PCIe SSD hitting 2200 MB/s read and 1440 MB/s write in the sequential benchmark with the overall score being 2,708 points! 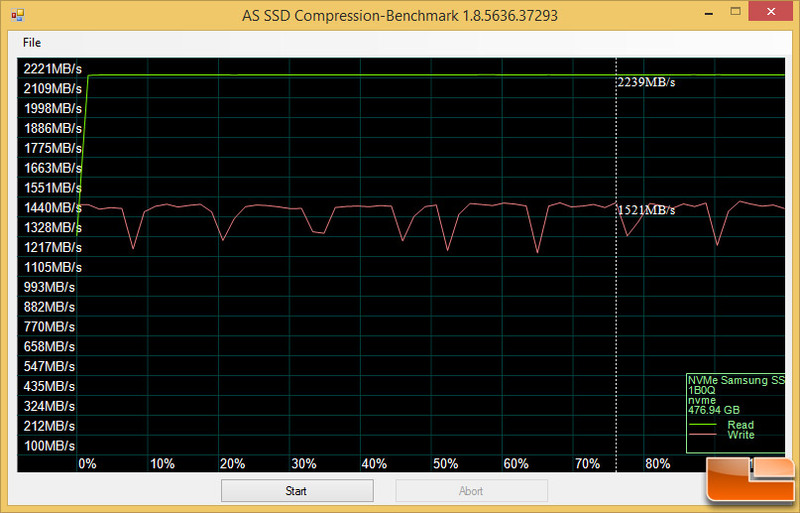 For those that like the results in IOPS that would be 13k IOPS read and 40k IOPS write in the AS SSD 4K test. Benchmark Results: The copy benchmark test results were amazing with around 1,835 MB/s for the ISO test, 580 MB/s for the Program test and finally 1,485 MB/s for the Game test. Benchmark Results: For this benchmark chart you would ideally want to see a straight line as you don’t want any compression performance loss as the test goes from 0% compressible to 100% compressible data during the benchmark test period. 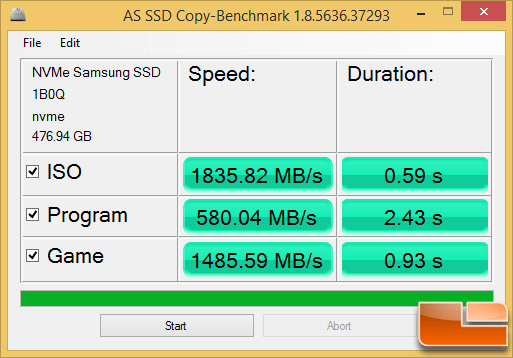 Performance on the Samsung SSD 950 Pro 512 GB drive was pretty flat on the read test at 2239 MB/s, but the write test jumped around between 1250 MB/s and 1521 MB/s. as you can see from the screen shot above.